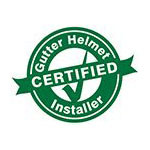 NWA Gutter Systems has been in the gutter business since 2008 and started being a Gutter Helmet® distributor in 2012. We are a small family owned company that concentrates on protecting homes in Northwest Arkansas through water management with the installation of quality seamless gutters, downspouts and gutter covers. There isn’t a more effective gutter protection system than Gutter Helmet to prevent leaf and debris buildup. When gutters become clogged and rainwater no longer flows to your downspout and away from your home, over spilling water can seriously damage your home. The first stage is the erosion of soil around the foundation, which eventually may cause cracks in the foundation leading to moisture or flooding in the basement. Overflowing water will also damage the soffit often, causing it to rot. We have had to repair or replace many soffits on our client’s homes before installing new seamless gutter systems because of this. That is why we always recommend that homeowners have gutter caps put on their new systems. Of course, you can always climb up a ladder and remove the debris yourself or pay someone to do it! However, if you are like most people, you have better things to do with your time or money. Get the Protection Your Home Deserves! Why not save yourself the trouble and expense of cleaning your gutters or having to repair damage from overflowing rainwater? Have NWA Gutter Systems install a new seamless gutter and America’s number one brand of gutter protection, Gutter Helmet! We also offer soffit repair and installation, and pressure washing. NWA Gutter Systems has an established history of reliable customer service. Please give us a call today at (800) 824-3772 or fill out the online form to receive the protection your home deserves!